We’ve passed the two-month mark since Repairer Driven News’s official launch, and we thought we’d present a mix of highlights for our newer readers. 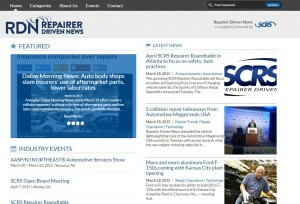 5 collision repair takeaways from Automotive Megatrends USA: Repairer Driven News attended the vehicle lightweighting track of the Automotive Megatrends USA summit on Tuesday with an eye towards what the new weight-reducing materials in cars and trucks mean for collision repair. Here’s what we learned about collision repair in an era of aggressive lightweighting. Indiana Auto Body Association director discusses lawsuit against car insurers: A judge has recommended a lawsuit against auto insurers by collision repairers and the Indiana Auto Body Association be dismissed but gave them the chance to refile it, and the association’s director was unfazed by the idea. Find out about candidates, rules for the 2015-16 SCRS board election: Nominations have closed for the election to the 2015-16 Society of Collision Repair Specialists Board of Directors, and SCRS members should take note of the candidates and the election rules and deadlines. Examining who bought in on PartsTrader’s $30M stock sale: PartsTrader announced Tuesday that it had raised $30 million from a new private stock sale, and we’d thought we’d take a look at who’s buying into the controversial business. ‘Steering’-related order bars No. 2 AAA group from letting Safelite administer Minn. glass claims: In what a glass trade group called a major blow against insurance “steering,” the second largest AAA club has been barred for using Safelite to administer auto glass claims in Minnesota. Va. collision repairer warns NBC12 viewers about aftermarket parts: As large parts of the country dig out from snow, a Richmond, Va., body shop owner was featured on NBC12 warning viewers about aftermarket parts. How auto body shops can keep workers — and vehicles — safe from aluminum dust: Aluminum dust gained more attention recently with Automotive News’ reposting of June 2014 coverage of the substance’s flammability that also took a look at the debate on preventing dust corrosion. Let’s talk about the two concerns (and a more general one) so you know why you’re spending the money on either barrier, Wet Mix gear, and the dedicated aluminum tools Ford requires to make its list. ‘Anderson Cooper 360′ piece attacks insurers for ‘steering,’ parts (video): An “Anderson Cooper 360″ piece Wednesday night criticized insurers for mandating salvage or aftermarket parts and “steering” customers to corner-cutting body shops. Consumer Reports criticizes Edmunds for F-150 test, notes aluminum requires more skill: Reopening the controversy, Consumer Reports has chastized review competitor Edmunds for failing to use a Ford-certified repairer in its high-profile report of a January sledgehammer test but acknowledged the expertise needed to work with the metal. GMG experiment questions auto repair gear’s isocyanate protection: GMG Envirosafe Chief Operations Officer Brandon Thomas has caught the attention of the auto body repair and personal protective equipment industries with an informal test that found isocyanates penetrating some common paint suits.